If We want to buy this board (I want cubieboard 2) in India from Minland, Do we need to pay custom duties or just Its price + Shipping cost? No need to pay custom duties. If I read it properly, cubieboard processor has highest cost to performance ratio. Can you pls. suggest any other development board which has processor having low cost to performance ratio. Since i will be buying one board only, it is better to enquire properly before using it. Its depend on your usage and your long term plan. 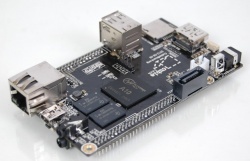 I can suggest either go with BeagleBone Black or Raspberry Pi. OK.I checked beaglebone and raspberry pi. Both have 512 MB Ram. Anyways, can u pls tell me how to calculate cost to performance ratio. I will do that myself. Can you please share with me What is your intended project ? I will update you soon.